New Series The magazine Big Gold began producing a new Galaxy Express 999 series in 1996 (or 1997). It's like a merging of all of Matsumoto's major works, from Harlock (Albator) to Yamato (Starblazers)! More info here, with links to official sites. Matsumoto Reiji is known for his spectacular drawings of machines, mecha, and broad vistas of outer space ... but also for his comparatively "sloppy" drawings of humans. The original Galaxy Express 999 has the best of both, and is one of his best works in general. The original 999 is mostly a collection of short stories, following our hero Hoshino Tetsuro as he travels toward the Andromeda Galaxy from Earth. Many of the stories cannot be taken scientifically seriously; they are more like allegories and parables about human psychology and the human spirit. In the worlds Tetsuro travels to, he meets everyone from mechanized people, to the ghosts of beloved pet animals, to a King Kong-like gentle giant... underwater people, insectoid people, even talking dinosaurs. He sees planets completely mechanized, he sees a 20th-century Earth-like planet, he sees planets that are always summer-y, planets always winter-y, planets that are always foggy, planets shining like gold, planets beset by constant earthquakes, and even an industrial planet where it rains screws. But where ever he goes, he touches people with his youthful, kind, determined spirit. In the cowardly, he evokes jealousy and hatred; in the meek, he earns trust; in the ancient, he inspires the release of pent-up tears. He's innocent enough to reach out to the sad and hurting, but feisty enough to use his gun Wild-West style when challenged to a duel. So it is that his traveling companion, the mysterous and wise Maetel, often says of him: "Because he's Tetsuro, he'll be OK."
Book One, Original Series: Hoshino Tetsuro is a 10(?) year old boy, living in poverty on the Earth of the far future, a world in which the non-mechanized people are poor and oppressed. He and his mother live in a tiny shack and are busy preparing for the hard winter ahead. But a hunting party of mechanized noblemen chance upon them, and just as if they'd come across a deer, they kill Tetsuro's mother and carry her off as a prize. Tetsuro vows revenge. He is unexpectedly helped by Maetel (sometimes spelled "Maeter" or "Maetre"), a beautiful blond woman dressed in all black (who bears a striking resemblence to his mother), who lends him a gun. After Tetsuro has wrought revenge on the mechanized nobles, Maetel offers him a rail pass to the Galaxy Express 999. The Galaxy Express 999, she explains, is a train that can take him from the Milky Way to the Andromeda Galaxy, in which there is a planet that will give him a mechanized body for free. Her only condition for giving him this pass is that he allow her to accompany him. Though mystified, Tetsuro sees that this pass is his single chance to get off Earth, see the universe, and get a mechanized body and thus live forever. "The Song of El Alamein." Tetsuro and Maetel arrive in a peaceful desert graveyard of dead tanks and machines of war. Many years ago, Maetel explains, a great war had raged on this planet of El Alamein (named after the African WWII battlefield of Old Earth), so fierce that all the people had finally died. Now, only the weapons of war remain, and all is peaceful. But looks are deceiving; the machinery, sensing human presences, awaken. Tetsuro and Maetel find themselves surrounded by the computerized tanks; Maetel has to shoot Tetsuro and herself so as to temporarily suppress their vital signs. They're rescued and safely brought back to the train. Looking out their windows, they see the tanks asleep, and quiet reigns again over the planet of El Alamein. War, Tetsuro realizes, would not happen without people. Without people, the world would be peaceful, and the killing machines of El Alamein would sleep on in eternal silence. "The Planet of Beggars." Tetsuro and Maetel arrive on a planet that has degenerated to the point where all of its inhabitants are beggars. Life was so hard for the planet's settlers, Maetel explains, that finally everyone either moved off, or gave up. Thus, all the people left on the planet are those who have lost the will to try to work or to do anything but whine and beg for food and money. The beggars are now so obnoxious that the train is only scheduled to stay for a brief time. But even after the train departs, the bad odor of unwashed bodies still permeates the train. Tetsuro and Maetel discover that one of the beggars has slipped aboard --- except the beggar is one who demands money and clothing at bow-point. Tetsuro willingly hands over his laser rifle, and Maetel donates her clothing (the beggar has brought his girlfriend, who needs clothing). They even suggest that the two ex-beggars take a shower. "Beggars don't need showers!" is the retort, but Maetel replies: "You are not a beggar any more. You are a robber." He is no longer a beggar; he is a robber, one who at least has the desire to fight for a better life, one who has the will power and determination to claim a meaningful future for himself. Tetsuro helps convince the train conductor to let the robber and his girlfriend escape. "They may be the hope and future of their planet," Maetel explains. "They are the first to face their lives with something other than laziness and despair." And though Tetsuro never sees the robber and his girlfriend again, he occasionally dreams of them, strong and proud and firmly in control of their own destinies. The finale of the manga series differs in scale from the movie. The movie ending (if I recall correctly) had Harlock and Emeraldas and their big guns. The paper version does not, and seems much quieter. The very ending of the manga also differs from the TV show (assuming what I saw was the TV show and not a TV special). The TV show saw Maetel boarding the 999 with a new youngster. The manga lacks that small poignant detail (though Maetel's future journeys with others was already predicted in one story). Presumably, Tetsuro goes on to live his life without Maetel -- but this presumption is proven wrong. And then there's the new series. More below. Galaxy Express 999 occurs in the same universe as Captain Harlock and hence, of course, Queen Emeraldas. Though Tetsuro only briefly meets Harlock, he also meets Emeraldas. In the movies "Galaxy Express 999" and "Adieu Galaxy Express 999," as well as in the new 999 series, Harlock and Emeraldas have considerably larger roles. There's also a connection between Galaxy Express 999 and Queen Millennial (Sennen Jyou-ou); namely, Maetel (and maybe Emeraldas) are the daughters of the Queen. Here's also a little list of 999/Harlock factoids. Also, the movie "Adieu Galaxy Express 999" concerns a second trip out to Andromeda, AFTER the first series. It includes a stop by Rametal (Larmetal), home of Maetel and her mother (who supposedly arrived by ship, though this story is different from what's in Queen Millennial); it also includes a nasty "Black Knight" who looks and acts suspiciously like Darth Vader (he's Tetsuro's father and knew Harlock well). There are other minor things in this movie that shed light on the Maetel story, yet which contradict other works. Yeah, well! The new GE999 occurs what appears to be just over a year after Tetsuro's return to Earth from the previous adventures (though more than a decade later in Real Life). Maetel, ever ageless and yet time-worn, has returned to Earth for a mysterious reason ("Destiny," she quips to the conductor). She finds the Earth overrun by terrible cities, with humans kept fat and contented like cows intended for slaughter. Tetsuro himself has been chained in the city depths, where he is kept well-fed and harmless. Maetel frees Tetsuro (the reunion is briefly emotional) and gives him a new train pass for the new GE999. With Tetsuro's new but obligatory-Matsumoto-pet-cat-named-Mee, they once again board the star-bound locomotive. The solar system and the locomotive have all changed drastically since Tetsuro had last seen them. Mars is a wasteland again. Shadow has forgotten him. The locomotive's computerized engine/engineer is now "incarnate" in a humanoid female android body. Captain Harlock is downright cheery and talkative! Clair has been mysteriously resurrected. And Queen Emeraldas is missing (though she turns up later). Maetel and the various heroes of the local galaxies seem to be moving to fight a strange, mysterious threat, the Dark Queen --- who has first enslaved humanity in meaningless luxury and who then casually destroys the Earth! So far, the new short stories have had some of the old Matsumoto charm, though as with DNASight 999.9, some of the "edge" seems to be missing. The "underlying continuing plot" aspect is new for GE999, and it changes the flavor somewhat. And what with the addition of the requisite cat, and the locomotive/engineer's persona, the resurrected Clair, not to mention the downright cheerful Harlock (and even dead Tochiro!) who keeps dropping by, it's like a continuous chummy family reunion on board the 999. There's an overall "fluffier" feel than the old series, despite the tears and philosophical soliloquys that seem to flow even more freely than ever. There seem to be a lot more scenes of Tetsuro, Maetel, Harlock, Tochiro, and Emeraldas showing off their power, putting idiots in their place, giving away sound-bite-sized bits of mysterious backstory, and making short speeches. It reminds me of a walking showcase of past Matsumoto characters, each character made to give a patriotic spiel to boost Tetsuro's (and the reader's) sense of grandiose destiny. In other words, it all feels overdone. Perhaps just as bad, in my personal opinion, are the subtle changes in art style. Maetel's eyes (as well as Harlock's) have been changed, via an extra outer iris layer that makes them look much bigger -- to me, they have lost some of their previous austerity and sadness. Many of the lovely cosmic images look recycled, somehow (though Matsumoto can still draw some great spaceships and planets) -- some scenes are rather obviously re-used elsewhere with minor alterations (I suppose it's cheaper that way). And Matsumoto's "sloppy" art style for organic beings now seems to have more errors in proportion than ever before. However, I'm not convinced this build up of exposing everything is a good thing. Moreover, the big merging of Yamato, Harlock, Emeraldas, Millennial Queen and 999 reminds me of Isaac Asimov's disastrous merging of his Robot universe with the Foundation universe -- IMHO, it ruined Foundation. With Matsumoto, there have always been intriguing hints of some of these connections, but this mixture seems too blatant. All in all, somehow I can't like this new series nearly as much as I liked the original. The original had more class, somehow -- it was less frenetic, calmer, more personal, more peaceful, cleaner, and less grandiose. Some of the magic got lost between the original and the new series, at least in my opinion. My little list of 999/Harlock/Emeraldas factoids. Great Harlock Goetterdaemmerung. The back issues and also in English (reversed pages)! 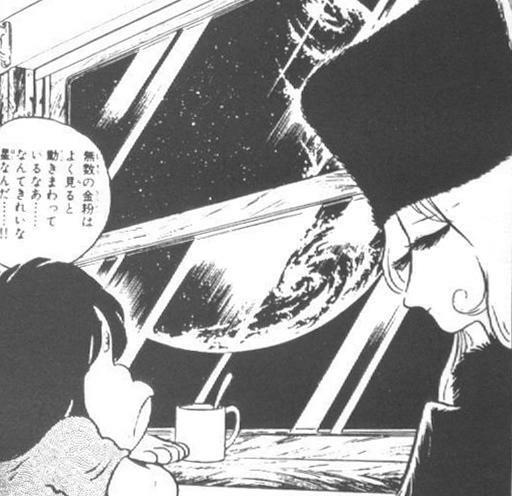 Maetel talks about her mother (she sort of implies she was born before Yayoi left Earth, though this would seem unlikely) and she talks of her mother here again. 999 passes near a Yamato-style ship (it's supposedly a prototype, sent out in 2199 for a warp test) Tetsuro names the Yamato by name and compares the prototype to the real Yamato's engineering (with the Arcadia in the background). Tetsuro welcomed onto the Arcadia and Tetsuro talks to Tochiro on the Arcadia and explains he's taken care of the mantle and hat. A nice landing shot that's re-used here. Maetel gets a call from Emeraldas. Note the phone. Arcadia with Yamato and color Yamato with the 999, and discussing the Yamato. Galaxy 999 image is property of Leiji Matsumoto and applicable publishing firms. Used under "fair use" academic/press clause only.